Chicken Corn Chowder that is lightened up, infused with Mexican seasonings, all made in one pot and on your table in less than 30 minutes! 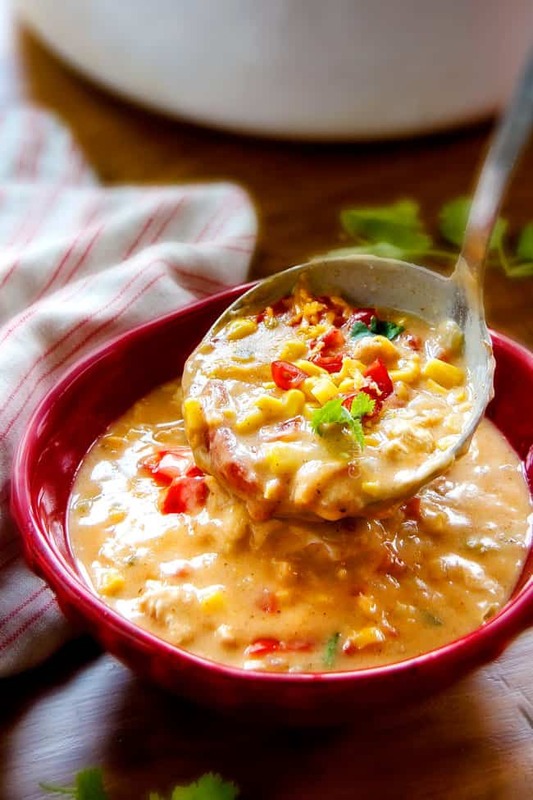 This Chicken Corn Chowder is loaded with juicy chicken, corn, tomatoes, red bell peppers, cheese and the options of potatoes, rice and/or bacon! Its cheesy, creamy (without any heavy cream! 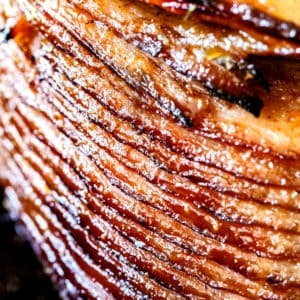 ), comforting and the layers of flavors are out of this world. It is mostly “dump and run” but tastes like it’s been simmering for hours! I’ve also included tricks for lightening up this Chicken Corn Chowder which you will love – almost as much as you will love the creamy, fiestalicious slurpfuls. Almost. I have a lot of soup recipes because I LOVE Soup, many of which I have lightened up like my White Chicken Chili, Broccoli Cheese Soup, and Potato Soup and while I love them all, this creamy Chicken Corn Chowder is definitely a favorite. I craved this soup until every last drop was gone. And then some. I think you will crave it too. This One Pot Chicken Corn Chicken Chowder recipe, comes together incredibly quickly and the majority of “making” this corn chowder is simply dumping in cans and spices. Your taste buds will be blown away at the punch of flavor from so little effort and they definitely won’t believe this soup is lightened up! Corn Chowder is a thick and creamy soup traditionally with chicken and potatoes. I’ve taken traditional Chicken Corn Chowder and added Mexican seasonings to create the most flavorful corn chowder you’ve ever tasted! How Do I make Healthy Chicken Corn Chowder? Roux: Making a roux of flour, olive oil and butter then adding chicken broth creates a thick, creamy sauce-like base. This eliminates our need to use heavy cream. Cream cheese: Using 1/3 fat cream cheese adds a rich, creamy tanginess without as much fat as heavy cream. Creamed corn: Creamed corn adds extra body to the corn chowder and the same trick I use in my Skinny Buffalo Chicken Mac and Cheese (amazing). The natural creaminess of creamed corn is a life changing as a secret ingredient. What Ingredients do I need for Chicken Corn Chowder? 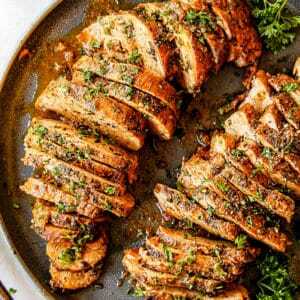 chicken breasts: I use chicken breasts because they area leaner but you can use chicken thighs if you prefer. garlic: you can substitute 1 1/2 teaspoons garlic powder. jalapeno: the jalapeno will not make this Chicken Corn Chowder spicy – just add some flavor. You an add more heat with hot sauce or cayenne pepper at the end of cooking. red bell pepper: you can substitute a green bell pepper if that’s all you have on hand. flour: I’m sure gluten free flour would work great here. chicken broth: make sure you use low sodium chicken broth or your Chicken Corn Chowder might be too salty. seasonings: cumin, chili powder, smoked paprika,a dried oregano, salt and pepper – I can almost taste the fiestaliciouusness! cream-style corn: a must to make this soup extra creamy! cream cheese: make sure your cream cheese is quite soft so it will melt easily. Can I use Frozen Corn for Corn Chowder? I prefer fresh or canned corn for this Chicken Corn Chowder recipe because the texture holds up better. Canned Corn: drain and rinse before adding to the chowder. Fresh corn: you will need about 2 cups sweet corn. Frozen corn: use only as a last resort. Make sure the corn is thawed before adding to the soup otherwise it will add extra liquid which will make the chowder less creamy. Can I use Rotisserie Chicken for Chicken Corn Chowder? Absolutely! You will need about about 2 1/2 cups shredded rotisserie chicken. Add the chicken to the corn chowder after step 4, before you add the cheeses. Can I add Vegetables to Chicken Corn Chowder? Absolutely! I’ve stuck with the basics, but you can add zucchini, carrots, potatoes, etc. 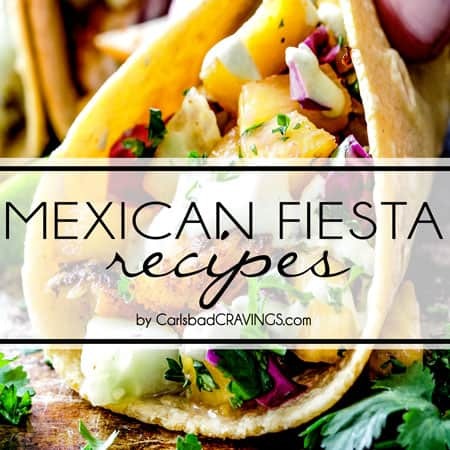 You can also add black beans! Can I add Rice to Chicken Corn Chowder? I love the added texture of rice! You can add cooked rice to creamy Chicken Corn Chowder (I LOVE wild rice) or you can cook your rice directly in the soup like I do in my Chicken Fajita Rice Soup. If you choose to cook your rice in the soup you will need to add additional chicken broth and adjust cooking time accordingly. How do You Make Chicken Corn Chowder? add your bell peppers, garlic, and flour and cook for two minutes then its dumping time! add your chicken broth, creamed corn, whole corn, diced tomatoes, green chilies and all seasonings/spices. bring to a boil then reduce to a simmer, uncovered, for 10 minutes, stirring occasionally. finally, stir in your Mexican cheese and reduced fat cream cheese until wonderfully smooth and creamy. How do I thicken Chicken Corn Chowder? 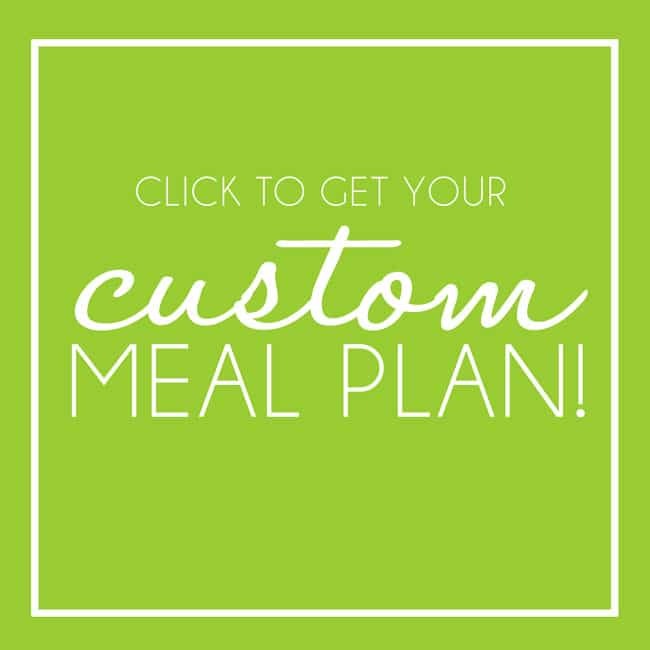 You can customize the consistency of your Chicken Corn Chowder by adding either heavy cream or additional cream cheese for a creamier soup. For a thicker soup, whisk 1 tablespoon cornstarch with 1/4 cup water and add to soup then simmer for 5 minutes. For a thinner soup, add addiitonal milk or chicken broth. What goes with Chicken Corn Chowder? Toppings, toppings toppings! Toppings are part of the fun of Mexican Chicken Corn Chowder and a way for everyone to customize their soup. Toppings like cheese, avocado, cilantro, tomatoes, tortilla chips etc. How long does Chicken Corn Chowder Last? Not very long at our house! You can refrigerate Chicken Corn Chowder in an airtight container and store in the refrigerator for up to 5 days. Can I freeze chicken Corn Chowder? I do not recommend freezing Chicken Corn Chowder with the cream cheese and cheeses because the fat in the cheeses will separate and create a funny texture. 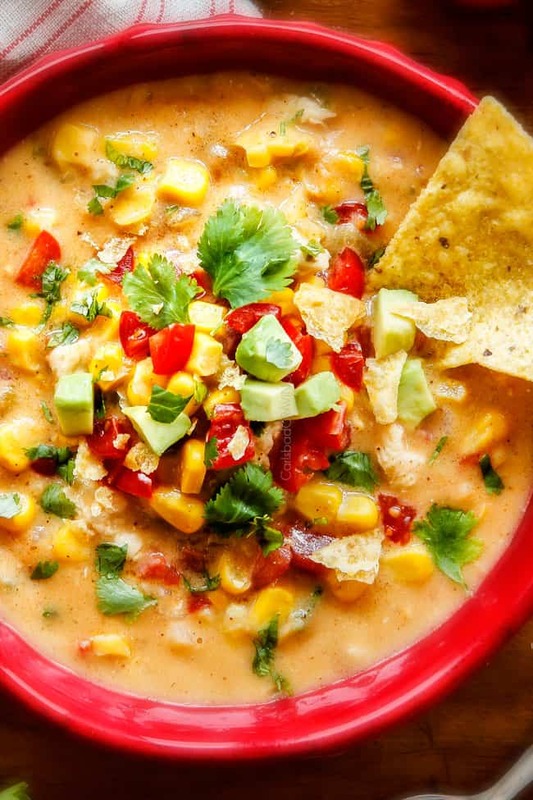 You can freeze your Chicken Corn Chowder without the cream cheese and Mexican cheeses. How do I freeze Chicken Corn Chowder? 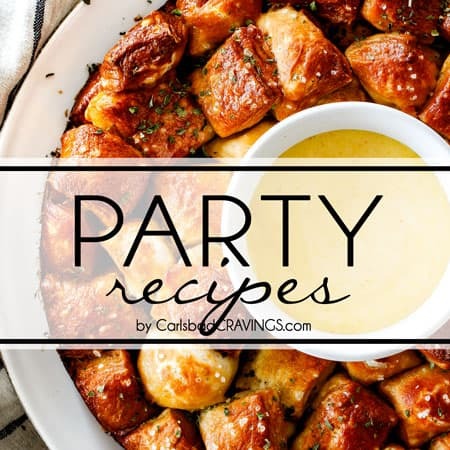 Follow recipe up to the point of adding cream cheese – do not add cream cheese or cheeses. Add Chicken Corn Chowder to a freezer size bag or airtight freezer safe container. 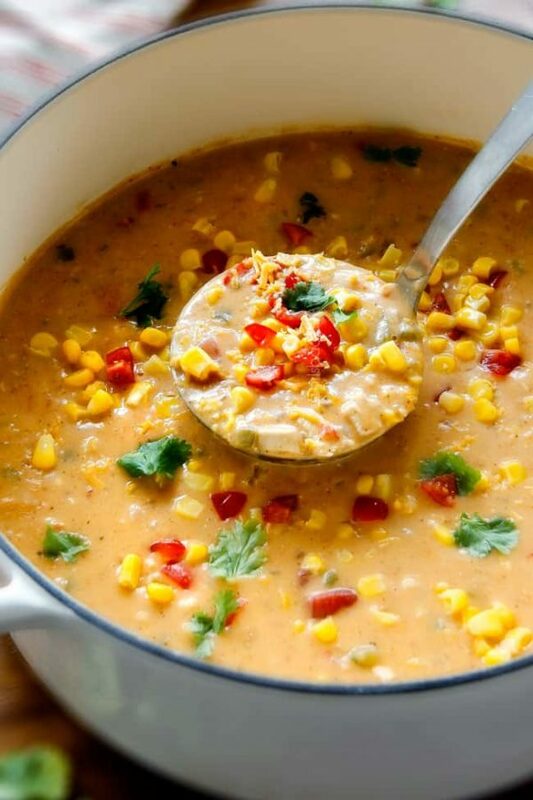 When ready to eat, let corn chowder thaw in the refrigerator. Once warm, stir in cream cheese until melted followed by cheeses until melted. Want to try this Chicken Corn Chowder Recipe? This 30 Minute LIGHTENED UP Mexican Chicken Corn Chowder is destined to become one of your favorite soups ever! Its cheesy, creamy (without any heavy cream! ), comforting and the layers of flavors are out of this world - and all made in one pot! Melt butter in olive oil over medium high heat in a large Dutch oven/soup pot. Add chicken, onions, jalapenos and all seasonings and sauté for 3 minutes. Add bell peppers, garlic, and flour. Cook, stirring constantly, for 2 minutes. Turn heat to low and gradually stir in 3 cups chicken broth. Whisk 2 tablespoons cornstarch with remaining 1 cup chicken broth and add to soup. Stir in creamed corn, whole corn, diced tomatoes, and green chilies. Bring to a boil then reduce to a simmer, uncovered, for 10 minutes, stirring occasionally. Turn heat to low and stir in softened cream cheese and Mexican cheese. Continue to stir until completely melted. Garnish individual servings with desired toppings. I hope your surgery went well! I love your recipes, but more importantly you just seem like a good role model and example to those around you. Thank you so much Trisha for such kind words! Yes my surgery went well and feeling tons better a few days out. I am so happy to hear you have made the Skinny Potato Soup twice already! I am excited for you to try this one and hear which one you like better! Hi, Jen! Oh! I didn’t know about your surgery, I’m so glad everything went well. I’ll keep you in my prayers so that you do continue to recuperate. Now, your soup. Every one of your soups sound so good. We aren’t home at this time so it’s pretty hard for me to make a batch of anything we can’t consume in one meal. I’m pinning and sharing. Sending hugs!! Jen you are bar far my new favorite go to for anything yummy. 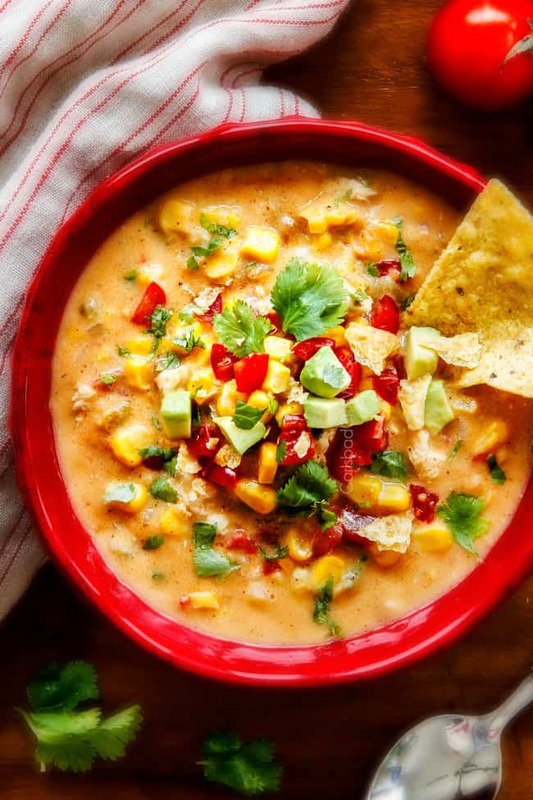 Your photos are to die for just made last week your one pot pepper jack cheese fajita soup. Was awesome. 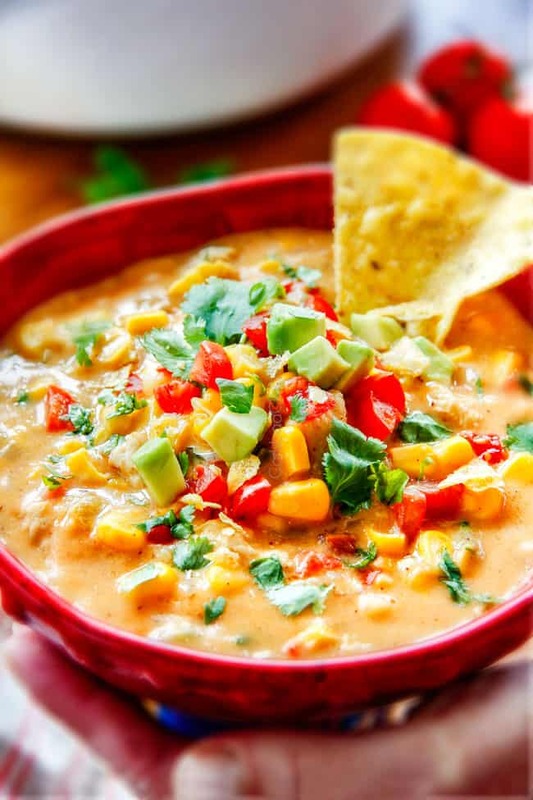 Im now going to try the 30 min mexican corn chowder. We love anything mexican in my house. Thanks and keep up the great work. What a kind comment/compliment Debbie, thank you so much! I love hearing you and your house are enjoying my recipes including the One Pot Pepper Jack Chicken Fajita Soup! I hope you love this one just as much! All the best to you and yours! So glad to hear you are feeling “tons” better already. It’s great when I check out an interesting recipe and find that I already have ALL the ingredients on hand. 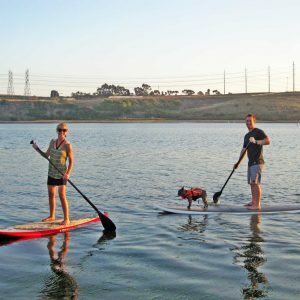 I can’t imagine what it would be like living in Carlsbad. I lived in San Diego, and Pacific Beach when I was a child. Living now in Northern California where we definitely have 4 seasons. Thank you so much Allie! What a small world! 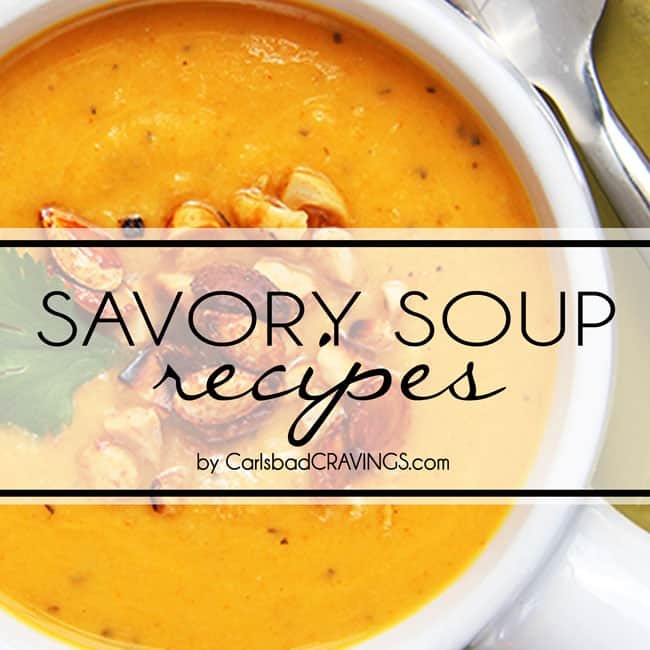 We love living in Carlsbad, but I grew up in Poway, so I have never really known 4 distinct seasons, but I am grateful for no snow 🙂 That is awesome you already have all the ingredients for this soup – I hope you can make it soon and love it! Sending you lots of healing vibes from the Bay Area! Hi Jenn your Im making your mexican chx corn chowder and your receipe calls for bell peppers in the instruction portion but not the ingredient list. Sorry about that Debbie! It should be 1 red chopped bell pepper, but it is not essential. I will correct the recipe. Thanks for spotting that! 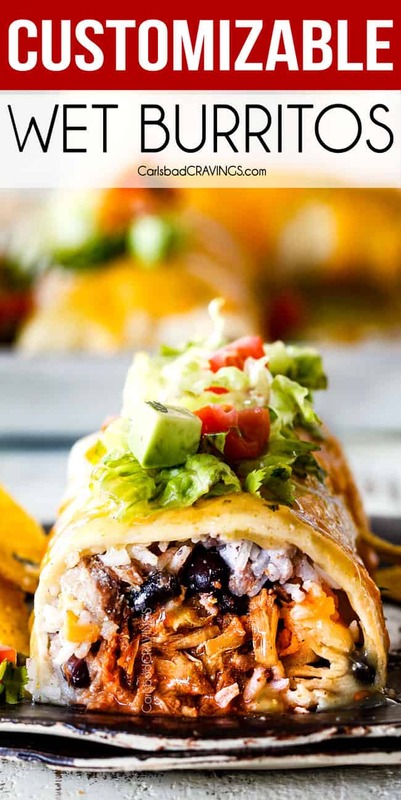 Jen, Not only are your recipes delicious but your photographs are incredible! I love that when I print out the recipe I get a small picture of the finished product. I’ve read your story and am amazed at what a strong, resilient woman you are. Best wishes for a speedy recovery. Hi Sherry, thank you so much for your kind comment! 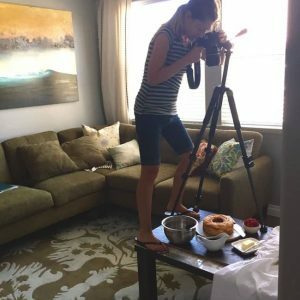 I have so much fun in the whole process from creating, cooking and photographing and feel truly blessed to be doing what I love and meeting wonderful people like you! Thank you so much for taking the time to read my story. It has been an incredible journey and I am so grateful for modern medicine and miracles 🙂 All the best to you and yours! You are so so kind, Sue, thank you! I am truly honored to be one of your favorite food bloggers – that means the world to me! Thank you so much for making my recipes and for your kind words! I hope you continue to love cooking from my site! Oh my you had surgery!! I hope you are doing well!! Ever since I started reading your blog you have inspired me! You have gone through so much but look at it with such an open heart, mind and spirit compared to how most people, myself included, would deal with things. Take care of yourself! Oh and this soup looks absolutely AMAZING!! So creamy, cheesy and delicious! Jen, I am a big fan of you and your recipes. May you continue to rebound quickly and feel strong! Speedy recovery and good thoughts are coming your way. So happy to have found your site, very yummy recipes, reminds me of my home. I am a 7th generation Oceanside-Carlsbad native, living in Missouri. I will follow your pins. Thanks. Thank you so so much Claire, I really appreciate the good wishes! You come from a long long line of Oceanside-Carlsbadians! I am so glad my recipes bring a taste of San Diego into your home. Wishing you all the best! You’re right, Jen – another amazing soup!! 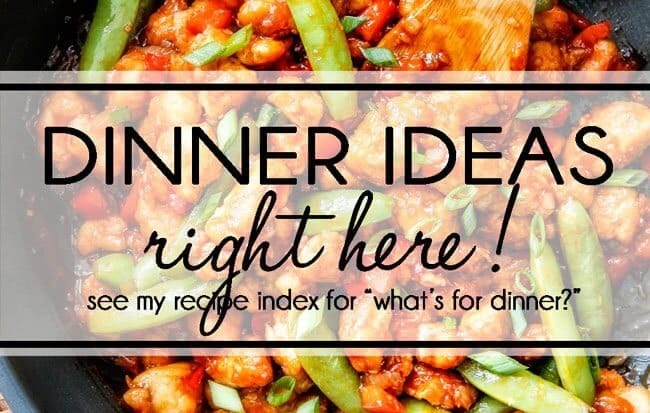 So delicious, am adding it to my ‘tried and true faves’ along with many of your other recipes! So glad to hear you’re feeling better….will continue to send healing thoughts your way! 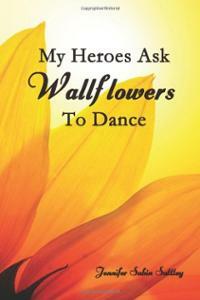 Thank you so so much for your healing thoughts Dawn, that means so much to me! I am almost as good as new 🙂 Thank you also for taking the time to comment and let me know this made into your “tried and true favs” – yes!!!! I am so honored you are enjoying my recipes! 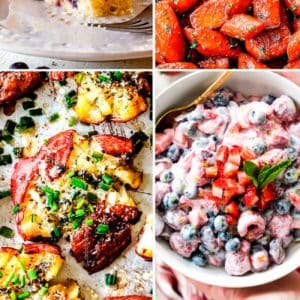 Well, we have to keep you healthy so you can keep sharing your wonderful recipes 🙂 Nothing brightens my day more than a colorful email in my inbox from Carlsbad Cravings! You take care and continue to be well, friend! This was delicious! I threw in a zucchini and used frozen corn in place of creamed corn (it was what I had on hand). My kids asked for seconds – Thanks Jen! Two winners in one week (we also loved the Red Curry Chicken, yummy!). 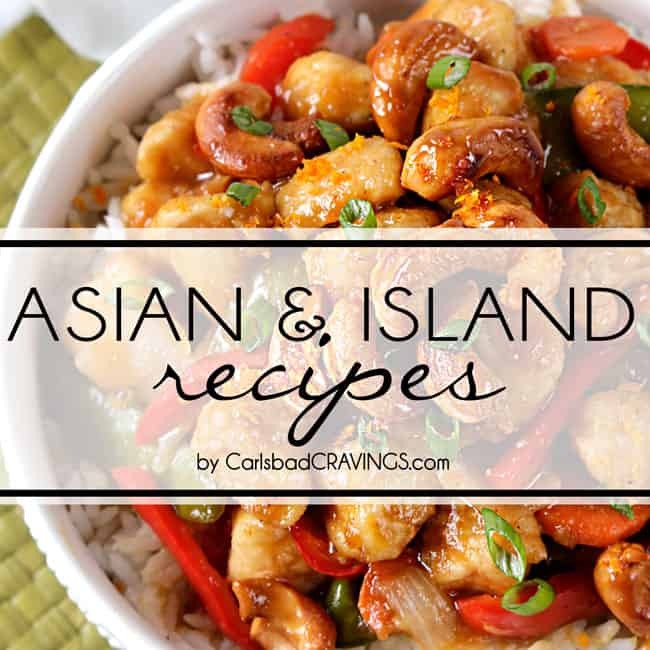 Hi Candace, I’m so glad this was a winner along with the Red Curry Chicken – yay! Your addition of zucchini sounds wonderful and I’m so glad it worked okay with the frozen corn! Thank you for trying my recipes! I bookmarked this soup when it was first posted but I just got around to making it tonight. Wow! It was a restaurant-quality soup. Totally tasted like something I would get from Panera. I appreciated your use of thickeners to give the soup some body and texture. Nice blend of flavors and textures. Clearly this makes a ton but I know what I will be having for lunch this week. 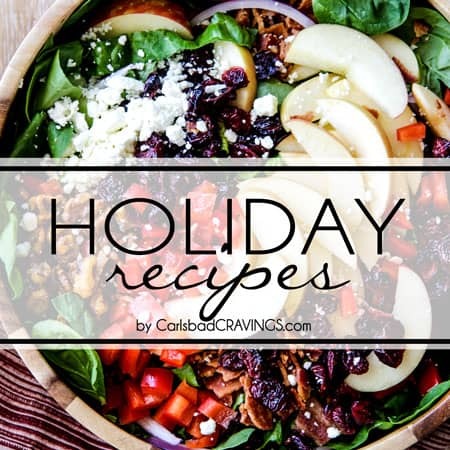 Carlsbad Cravings has become one of my new favorite food blogs to follow and make. Awesome Rachel, “restaurant quality” is an incredible complement – thank you so much! And I am SO honored I have become one of your favorite food bloggers – it doesn’t get any higher praise than that and I SO appreciate it! 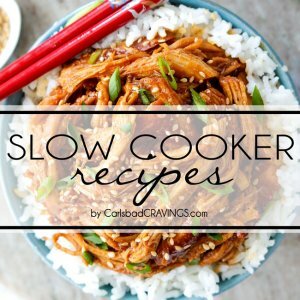 Thank you for following along and making my recipes! I love that you are enjoying them! Super cold here in Calgary Canada today so wanted something warm and flavourful and WOW this so completely fit the bill!! The spices and flavours were just awesome as well as I used spicy red pepper stewed tomatoes instead of just diced so it definitely added even more flavour. THis was delicious and I plan to make it quite a bit more often!! Thank you for your awesome comment Carmen! I’m so happy this warmed you up and your use of spicy red pepper stewed tomatoes sounds amazing! I hope you enjoy many more of my soup recipes on these cold winter days! You are so welcome Amber! I’m thrilled it’s become a new family favorite!!! This was so easy and delicious!!! Only changes I made based on what I had, was probably double the chicken, and then I had two small cans of creamed corn instead of the large. This is a keeper and could not be easier! Awesome Pamela, thanks for taking the time to comment! I’m so pleased it is a keeper! I added a can of non fat evaporated milk and use less cheese to further lighten it up and it was delicious. Leftovers a couple days later even better. Thanks and pray God blesses you with his healing power.